In this fantastic prize draw each entrant may win a cruise to the Caribbean. 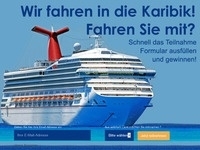 Is giving away a cruise for two persons for 1 week through the Caribbean. Experience the Caribbean from your dream boat. Simply register - and with a little luck, you're on. Participation is free.